The Online Business Awards, in association with Talk Business, focus on enterprising UK companies with a powerful online presence and aim to recognise the best in Britain, drawn from all the countries within the United Kingdom. 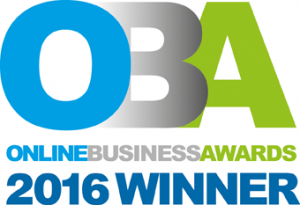 The winners of the Online Business Awards 2016 have been announced and Pali is delighted to have won the Legal & Professional Category. The Online Business Awards are impartial, independent and objective and their aim is to seek out examples of the UK's most excellent online business website and mobile site experiences - their effectiveness, design qualities, best practice and customer service - and to reward them publicly in print, online and at an annual UK event. Pali – Property And Land Information, is a multi-award winning, national conveyancing search company and has been providing the legal profession with quality conveyancing searches since 1999. Earlier this year Pali walked away with ‘Best in Sector for Searches’ and picked up the top award in the 'Supplier of the Year' category - the Gold award, in The ESTAS, the largest and longest running award scheme in the UK residential property industry. The ESTAS, which are hosted by property expert Phil Spencer, are unique because shortlisted and winning firms are selected purely on ratings from clients. This summer Pali also won Best Use of Technology in the Modern Law Conveyancing Awards, sponsored by Eclipse Proclaim. These awards recognise those taking the lead in innovating to find unique solutions for their businesses and clients, those who have achieved successes as teams or individuals, and those championing client care and is one of the most exclusive events in the legal calendar. All three trophies were added to Pali’s already impressive collection. Pali has a high client retention rate due to the flexibility of its service. Pali recognises it’s not a ‘one size fits all’ when it comes to the conveyancing industry and adapts its service to the individual needs of clients. What works for one solicitor may not work for another and Pali’s ever evolving and innovating system continues to improve and move with the times.